Fibroadenomas are one of the findings that can be seen on your mammogram. They are benign (not cancerous) breast tumors that are made of glandular and fibrous breast tissue. These lumps can occur alone, in groups, or as a complex. Multiple or complex fibroadenomas are associated with a slightly increased risk of breast cancer. Diagnosis may be suspected on a breast ultrasound, but a biopsy is often needed to establish the diagnosis. Some fibroadenomas can be left alone, whereas others may be removed via a lumpectomy or an ablation procedure. Most fibroadenomas are between one and five centimeters in diameter (0.39 inches to nearly two inches), but giant fibroadenomas can be the size of a small lemon, about 15 cm (5.9 inches). They are classified as either simple or complex, with simple fibroadenomas being more common in younger women and complex fibroadenomas more common as women age. A fibroadenoma may be detected when you examine your breasts, or instead, may only be detected during a screening mammogram. While doing your regular breast self-exam you may feel a breast fibroadenoma. These feel firm, round, smooth, rubbery, and are movable. They are so mobile that women sometimes refer to them as “breast mice” because they tend to run away from your fingers. These masses may feel tender, especially right before your period, when they may swell due to hormonal changes. 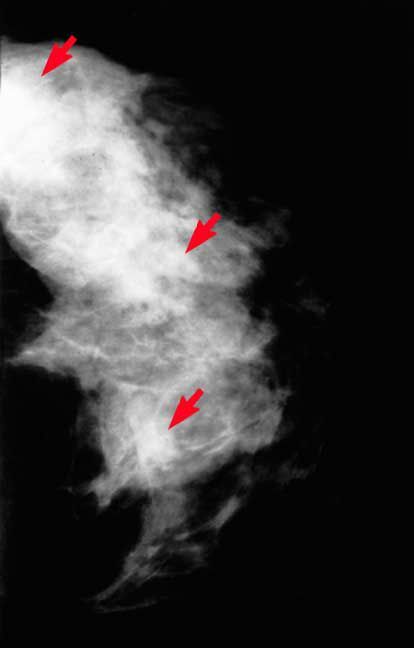 Fibroadenomas appear as round or oval smooth-edged masses on a mammogram. The outline of the mass will be clearly defined, not blurry, or invading the adjacent spaces. Sometimes they are accompanied by coarse calcifications. Fibroadenomas can look like cysts or a well-contained tumor. The exact cause of fibroadenomas is unknown. They seem to be influenced by estrogen because they appear most often in premenopausal or pregnant women, or in women who are postmenopausal and taking HRT (hormone replacement therapy). Most fibroadenomas change in size during your menstrual cycle, when your hormone levels are changing. Thus, during the menstrual cycle, the same adenoma can become more noticeable or it may shrink to the point where it is not readily palpable. These are most common in women who are from 15 to 30 years old and in pregnant women. Fibroadenomas occur in 10 percent of all women but in 20 percent of African-American women. They are much less common in postmenopausal women unless the women are on estrogen therapy. Roughly 10 percent of all fibroadenomas will disappear over time, and twenty percent will recur. If they don’t disappear, they usually stop growing when they reach two or three centimeters. If you notice a lump on exam or if an abnormality is seen on mammography, a breast ultrasound is usually the next step. This is especially true if you have dense breast tissue which can make a lump more difficult to visualize. On ultrasound, a fibroadenoma will be easier to distinguish from other tissue, because of the way it responds to sound waves. It will appear as a dark area, with a definite outline, homogeneous, round or oval, and may have smooth-edged bumps. If an ultrasound doesn’t give a definite result, the next study may be an MRI (magnetic resonance image). While imaging tests may suggest a fibroadenoma, the conclusive test to make an accurate diagnosis is usually a breast biopsy. There are different types of breast biopsy procedures, such as fine needle biopsy, cord needle biopsy, and an open biopsy, and the choice of test will depend on characteristics of the lump, its location, and more. Since fibroadenomas are benign, treatment will vary depending on your diagnosis. If it is small, painless, remains the same size, and a biopsy confirms a benign (non-cancerous) finding, you may not need further treatment. If this is the case, your doctor may recommend doing follow-up ultrasounds to make sure their is no change. Ablation techniques are preferred if possible as they can be done in the office, leave only a small scar, and result in a rapid recovery. While fibroadenomas are not cancerous, they can cause of great deal of anxiety during the diagnosis. They are also associated with a slightly increased risk of developing breast cancer, so it's important to have regular exams and screenings if you have been diagnosed with a fibroadenoma. American Cancer Society. Fibroadenomas. Updated 09/20/2017.